Fuzzibunz New Prints- Exclusive First Look! I excitedly opened the secret package delivered on the same day as the Great Cloth Diaper Change to see the two new prints from Fuzzibunz (and resisted all temptation to use them during the Change!) My first impression was “Cute, but a little busy.” Yes the prints have a lot going on- lots of shapes, patterns, and color (for Strawberry Delight). It took a few days of looking to begin appreciating them. It wasn’t love at first sight by any means! Initially I preferred the Whimsical Whale to Strawberry Delight. Strawberry Delight was just a bit too colorful- then I started reminiscing about my days in the 90’s and the spectacular neons and bold colors that we wore. The more I stared the more I started actually liking the bright colors and dominant pink/yellow hues with the powder blue lines. And of course I’m not oblivious to the current trend of colorblocking and BOLD neons! I still like the Whimsical Whales and think it is pretty darn adorable for a little boy but now I’m starting to prefer Strawberry Delight! If only I had a little girl to model it for me! (My little boy will have to do and he ROCKED that diaper while playing with his toy monster trucks.) We are breaking down walls here people! FuzziBunz® Strawberry Delight: FuzziBunz’s latest “flavor” cloth diaper is Strawberry Delight, a whimsical and magical cloth diaper print that is sure to please any baby girl and the mom who loves her too. Swirling pink strawberries surrounded by luscious oranges makes this latest cloth diaper design good enough to eat. 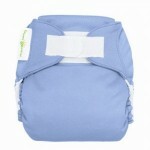 Your baby will enjoy wearing this cloth diaper on a fun spring or summer day at the park or pool. It also can be used as a reusable swim cloth diaper pant too, making this diaper as versatile as it is sweet! Available in FuzziBunz Elite One-Size Cloth Diaper and Perfect Sizes X-Small, small, medium and large. Ahoy, Matey! FuzziBunz’s latest cloth diaper print design will bring a delightful squeal to any baby boy and his doting mom too. Girls will love this whale of a design too! Whimsical whales adorn this blue and aqua green reusable cloth diaper that can be worn daily or for a day at the beach as a reusable swim diaper. Your child will have a whale of a time romping around in this adorable-yet-modern cloth diaper print. You’ll be seeing these new prints at all of your favorite Fuzzibunz retailers including Kelly’s Closet, a preferred affiliate partner of DDL. Thank you Fuzzibunz for this early sneak peek! *note that DDL does warn anyone using regular pocket diapers as swim diapers in pools because chlorine can break down the PUL and elastic and cause damage to your diapers. 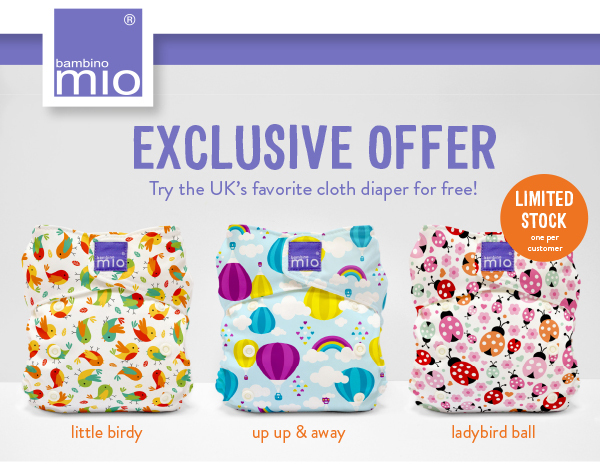 Try the MioSolo from Bambino Mio- FREE! Next articleAbby’s Lane $50.00 Gift Certificate Giveaway! THE List- Black Friday Sales 2014!